A few summers ago I developed 75 smoothie and juice recipes for my cookbook Smoothie-licious. Since I was working at Parents during the week I primarily tested recipes over the weekends, sometimes making 4 or 5 smoothie recipes a day. I blended, we sipped, discussed, and I blended again. You probably won’t be surprised to hear that after that summer Dave, Rosa, and lost our taste for smoothies for a while! But a few months later, our smoothie cravings were back to stay. In fact, I drink smoothies all year long, regardless of the frigid winter temperatures. As with every smoothie recipe, feel free to make these your own. Substitute your favorite ingredients, and leave out the ones you don’t like. The essentials (for my recipes) are a liquid, a fresh fruit, and frozen fruit. I don’t like using ice in smoothies, gravitating always to frozen fruit instead. The fruit adds flavor, nutrition, and a creaminess you just can’t get from ice. Plus the smoothie isn’t watered down as the ice melts. 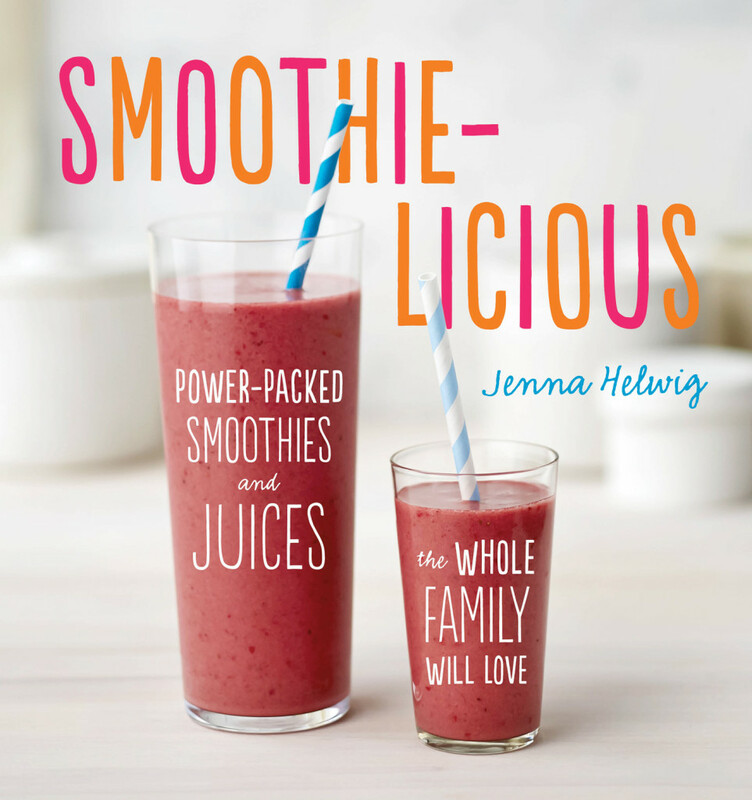 These are three of my favorite fruit-filled recipes from Smoothie-licious. This makes a thin, easily sippable smoothie, almost like a juice. For a thicker blend, add more frozen strawberries. Feel free to leave out the cilantro or substitute fresh mint. 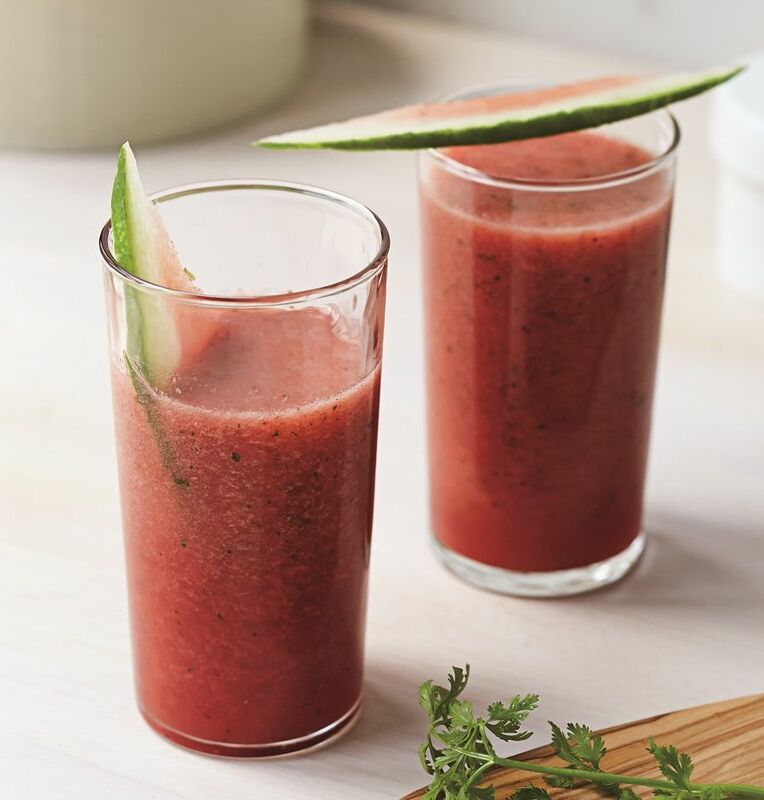 Add 2 cups watermelon cubes, 1/2 cup frozen strawberries, 1/2 teaspoon lime juice, and 4 sprigs cilantro to a blender. Cover and blend until smooth, about 30 seconds. Makes 2 small servings or 1 large one. 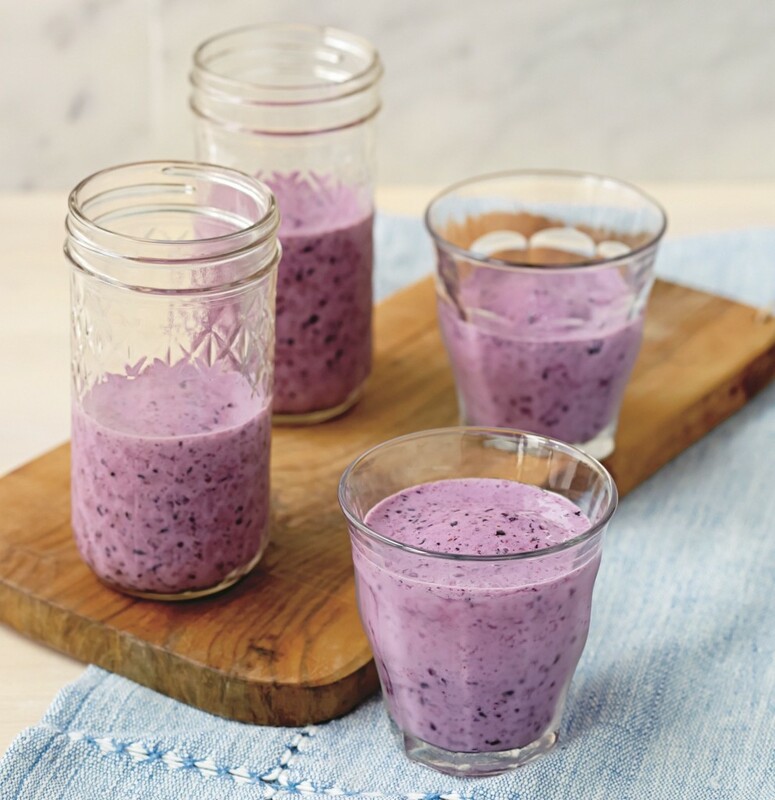 This pretty purple slurp is a quick and healthy alternative to a stack of blueberry pancakes. It’s sweet from the blueberries and syrupy from the well, syrup. Yogurt stands in for the buttermilk, giving a hit of tang. I like the sweet creaminess of regular milk here, but feel free to substitute coconut milk for a tropical twist. Add 1 cup milk, 2/3 cup reduced-fat plain Greek yogurt, 1 1/4 cups frozen blueberries, 1/2 teaspoon vanilla extract, 1/8 teaspoon ground cinnamon, and 2 tablespoons pure maple syrup to a blender. Cover and blend until smooth, about 30 seconds. Makes 2 servings. When I sip certain smoothies I’m transported to a beautiful sandy beach. 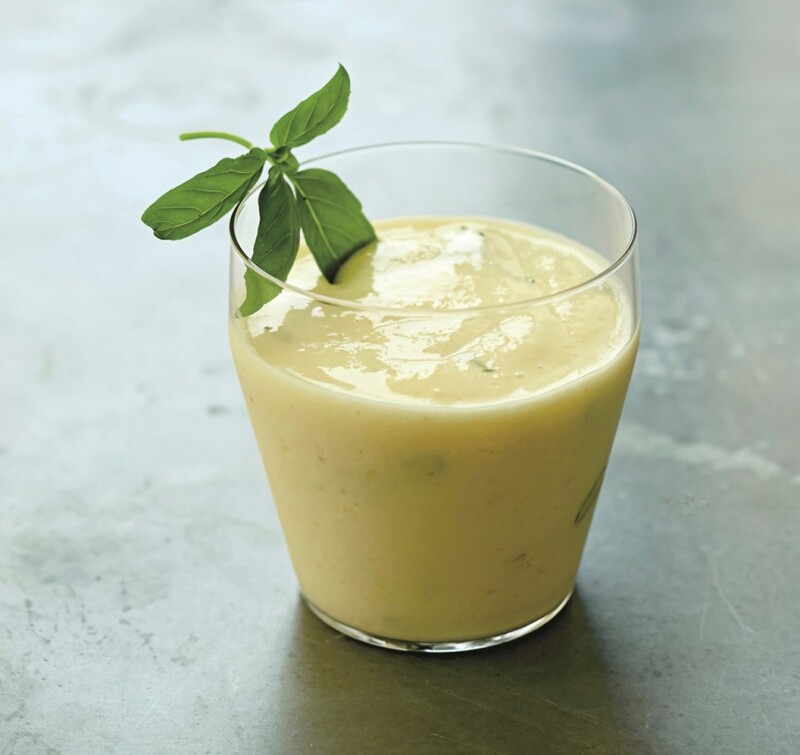 When I sip this smoothie I’m transported to a beautiful sandy beach… in Thailand, thanks to the basil and ginger. While it might seem strange to add a savory herb to a smoothie, basil has a slight licorice note and in small quantities it adds a beguiling, exotic flavor. What about babies and smoothies? 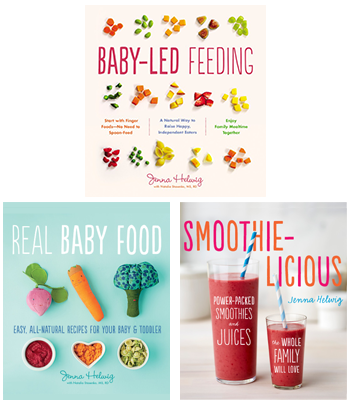 As soon as your baby can sip through a straw or sip from a cup smoothies are fair game. Just make sure it’s, well, smooth. While most babies can handle pieces of food, it can be a choking hazard to combine puree and lumps in the same mouthful. And no honey until baby turns 1. 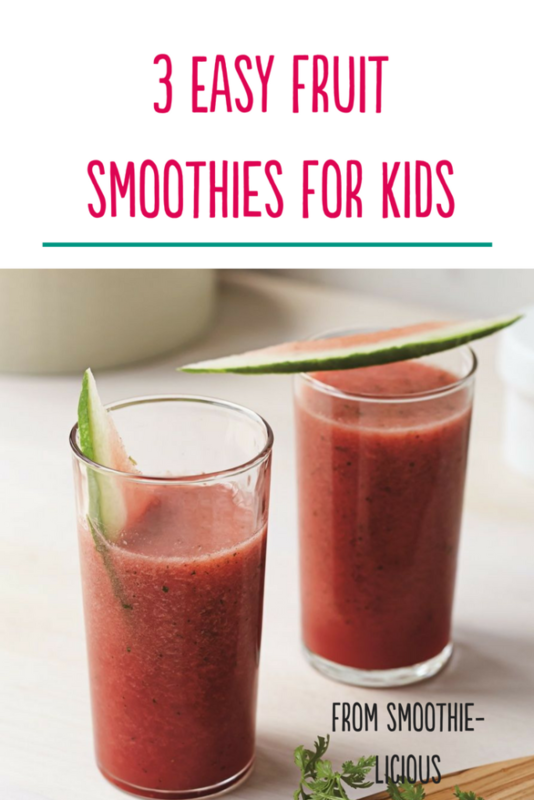 And if you have a toddler, you probably already know that smoothies are just about the perfect toddler food. Sweet, produce-packed, and dead easy to prep, they’re generally very well-received… to say the least! Recipes from Smoothie-Licious. Photos by Lauren Volo.